In 2018, the combined daily discharge of the six largest Eurasian rivers peaked on June 4, five days earlier than the average over the 1980-89 reference period. The combined daily discharge of the Yukon and Mackenzie rivers peaked on May 29, four days earlier than the average during the reference period. In 2018, summer/autumn discharge (July 15-September 30) for the eight largest Arctic rivers was 20% greater than the 1980-89 reference period. Since last covered in the Arctic Report Card in 2015, Arctic river discharge has continued to increase, providing powerful evidence for the ongoing intensification of the Arctic hydrologic cycle. The Arctic Ocean contains only about 1% of global ocean volume but receives greater than 10% of global river discharge (Aagaard and Carmack, 1989; McClelland et al., 2012). Consequently, terrestrial influences via river inputs are much stronger in the Arctic Ocean than in other ocean basins. Rapid change in the Arctic system is altering land-ocean linkages, impacting coastal and ocean physics, chemistry, and biology. Because rivers integrate processes occurring throughout watersheds, changes in the discharge and chemistry of large rivers can also signal widespread terrestrial change (Rawlins et al., 2010; Holmes et al., 2013). Reported here are river discharge values for the eight largest Arctic rivers, updating the 2015 Arctic Report Card chapter (Holmes et al., 2015). Together, the watersheds of these eight rivers cover approximately two-thirds of pan-Arctic drainage area and account for over 60% of river water inputs to the Arctic Ocean (Fig. 1). Discharge measurements for the six Russian rivers began in 1936, whereas discharge measurements did not begin until 1973 for the Mackenzie River and 1976 for the Yukon River. Thus, we used 1980-89 as a reference period, the first decade with discharge measurements for all eight rivers. Fig. 1. Map showing the watersheds of the eight rivers featured in this report. Together they cover two-thirds of the 16.8 x 106 km2 pan-Arctic watershed. The red dots show the location of the discharge monitoring stations and the red line shows the boundary of the pan-Arctic watershed. A long-term increase in Arctic river discharge has been well documented (Peterson et al., 2002; McClelland et al., 2006). There is still some uncertainty about what is driving this trend, but documented increases in cold seasons precipitation provide a particularly compelling explanation (Shiklomanov and Lammers, 2009; Overeem and Syvitski, 2010; Rawlins et al., 2010; Déry et al., 2016; Rood et al., 2017). The long-term increasing discharge trend has been greatest for rivers of the Eurasian Arctic and constitutes the strongest evidence of intensification of the Arctic freshwater cycle (Rawlins et al., 2010). In 2018, the combined daily discharge of the six Eurasian Arctic rivers peaked on June 4, five days earlier than the 1980-89 average (Fig. 2a). For the first nine months of 2018 (January 1-September 30), Eurasian river discharge was 7% greater than the 1980-89 average for the same period (Table 1). Discharge was particularly high in the Eurasian rivers during summer and autumn 2018, with their combined discharge over the period July 15-September 30 being 25% greater than the 1980-89 average for that same period (Fig. 2). Fig. 2. Combined daily discharge (measured in cubic meters per second) for the first nine months of 2018 compared to the 1980-1989 average for the A) six Eurasian rivers, and B) two North American rivers. All 2018 data are provisional. Table 1. Cumulative discharge for the first nine months of 2018 compared to the January-September average for 1980-89. Red values indicate provisional data and are subject to modification until official data are published. We are not able to calculate Yukon River discharge for January-September 2018 because we are missing data for April 1-May 17. The combined daily discharge of the Yukon and Mackenzie rivers peaked on May 29, 2018, four days earlier than the 1980-89 average (Fig. 2b). Discharge for the North American rivers from July 15-September 30 was 4% greater than the average over the 1980-89 reference period. When the Eurasian and North American rivers are considered together, their combined discharge in 2018 over the July 15-September 30 period was 20% greater than the average over the 1980-89 reference period. In 2017, Eurasian Arctic river discharge was 12% greater than the average for the 1980-89 reference period (Table 2). In 2016 and 2015, river discharge was 5% and 15% greater than the 1980-89 average, respectively. In fact, over the past 15 years, Eurasian Arctic river discharge exceeded the long-term average in all but two years, 2003 and 2012 (Fig. 3). 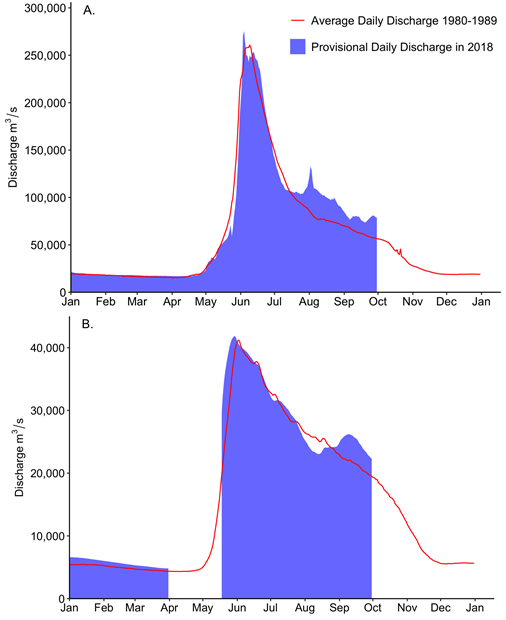 Taken together, these results indicate a continuing long-term trend of increasing Eurasian Arctic river discharge. Table 2. Annual discharge for the eight largest Arctic rivers since 2015, compared to long-term and decadal averages back to the start of observations. Red values indicate provisional data. *The first full year of Yukon discharge measurements at Pilot Station was 1976. Discharge measurements for the Yukon River at Pilot Station are missing for 1996-2001. The first full year of Mackenzie discharge measurements at Arctic Red River was 1973. Discharge measurements for the Mackenzie River at Arctic Red River are missing for 1997 and 1998. Fig. 3. 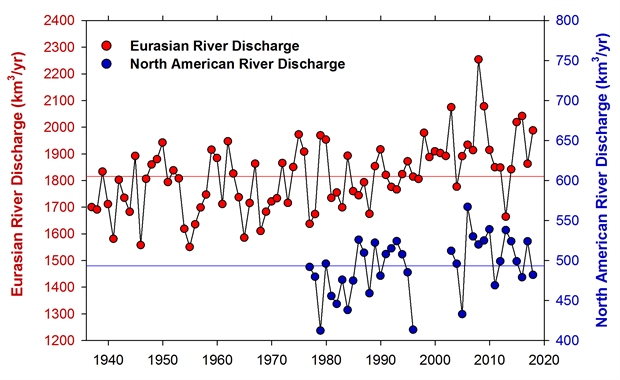 Long-term trends in annual discharge for Eurasian (red) and North American (blue) Arctic rivers. Note the different scales for the Eurasian and North American river discharge; discharge from the former is 3-4 times greater than it is from the latter. Reference lines show long-term means for the Eurasian (1816 km3/y, 1936-2017) and North American (493 km3/y, 1976-2017) rivers. In 2017, the combined discharge of the two largest North American Arctic rivers, the Yukon and Mackenzie, was 482 km3, slightly above the 1980-89 reference period (Table 2). In 2016 the combined discharge of the Yukon and Mackenzie river was 9% greater than the 1980-89 reference period, whereas in 2015 the combined discharge of these two rivers was very similar to the reference period (Table 2). Since 1976, the increase in the combined river discharge has been 3.3±1.6% per decade for the Eurasian rivers and 2.0±1.8% per decade for the North American rivers (Fig. 3; Mann-Kendall trend analysis ±95% confidence interval). Considering the eight Eurasian and North American Arctic rivers together, their combined discharge in 2017 (2470 km3) was 9% greater than the average discharge for the period 1980-89 (Table 2). Values for 2016 (2387 km3) and 2015 (2521 km3) were 6% and 11% greater than the 1980-89 average, respectively. Overall these results indicate that Arctic river discharge continues to march upwards, providing powerful evidence for the intensification of the Arctic hydrologic cycle. We thank the United States Geological Survey (Yukon), Water Survey of Canada (Mackenzie) and Roshydromet (Severnaya Dvina, Pechora, Ob', Yenisey, Lena, and Kolyma) for the discharge data used here. Most of these data are now available through the Arctic Great Rivers Observatory (www.arcticgreatrivers.org). This work was supported by grants from the National Science Foundation in support of the Arctic Great Rivers Observatory (NSF 1602615, 1603149, 1602680, 1602879). 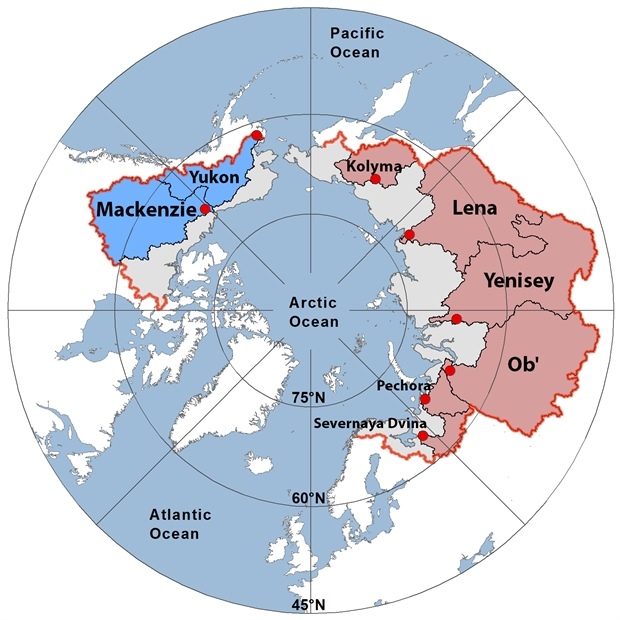 The processing and analysis of near real time data for Russian Arctic rivers was supported in part by the Russian Foundation for Basic Research (grant 18-05-60192).